Are you looking for the best places to visit in Nepal? Start with the breathtaking Himalayas, that’s what Nepal is well-known for. Nepal is relatively a small country yet, there is so much to explore in this beautiful tiny country. You can explore the diverse culture and unique architecture of this beautiful country. Nepal is also known for its wild landscapes, golden temples, and charming hill villages. 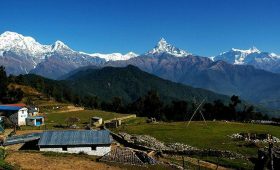 The beautiful view of mountains, pristine natural beauty make Nepal one of the world’s great travel destination. What to See while Traveling in Nepal? Kathmandu is the capital city of Nepal and has an incredibly diverse Hindu and Buddhist religious sites. It is one of the hustle and bustle metropolitan cities, yet, it is among the best places to visit in Nepal. But still, it has retained its ancient traditions, cultures, and religious sites. This city is purely blessed by living goddess Kumari and enriched by endless religious festivals and cultural events. Kathmandu is more than just a city. It is also a living museum where you get an opportunity to relive in the history of Nepal. Kathmandu Durbar Square– Explore the medieval temples and visit Kumari Ghar. You can get a glimpse of the little goddess, Kumari. Thamel– The most happening place Thamel is a must visit. Here, you can find everything you want. There are a variety of antique shops, trekking gears, bookstores, boutique cafes, clothing stores and so on. It is only the place where you can experience the night-life. The Boudhanath Stupa– The largest Buddhist stupa in Nepal. It is one of the most sacred places for Buddhist. The Swayambhunath Temple– This temple is the major landmarks of Kathmandu city which is also known as Monkey Temple. This holy place flaunts the white stupa with fascinating buddha eyes. The Pashupatinath Temple– It is a most sacred place for Hindu devotees. The main temple is purely dedicated to Lord Shiva. Patan– It is one of the oldest towns in the valley. You can encounter the beautiful temples, palaces, and monuments. It is nothing less than an architectural treasure. Bhaktapur– It is a well-preserved monumental area within Kathmandu valley. Here, you can find numerous temples like Changu Narayan Temple, Nyatapola, Bhairavnath Temple, and so on. A Nepal tour is incomplete without a visit to the beautiful city, Pokhara. Pokhara is a beautiful city, surrounded by the hills, mountains and famous landmarks like Begnas and Fewa lake. This city is also known as “ City of Seven Lakes”. This place is truly a heaven on earth. The major attraction of this place is the Fewa lake surrounded by the panoramical view of Himalayan peaks that reflects in this lake. You can enjoy boating or simply relax at the lakes near the city with the stunning Annapurna mountain at the backdrop. Pokhara is also for the adventure seekers who want to experience life to the fullest. In this city, you can experience everything from paragliding to ultralight flying, skydiving to zip lining. Pokhara is a starting point for the various trekking trail and expeditions in the Annapurna region. That’s why many travelers choose to stay in Pokhara for relaxation before they head out to the trek. Fewa Lake: Fewa lake is one the main attraction for all the travelers. There is the Barahi Temple in the middle of the lake. You can visit the temple and take boating experience on this lake. Begnas Lake: Enjoy the pristine natural beauty of this lake, all encircled by Himalayan peaks. You can indulge in boating, fishing, and swimming. 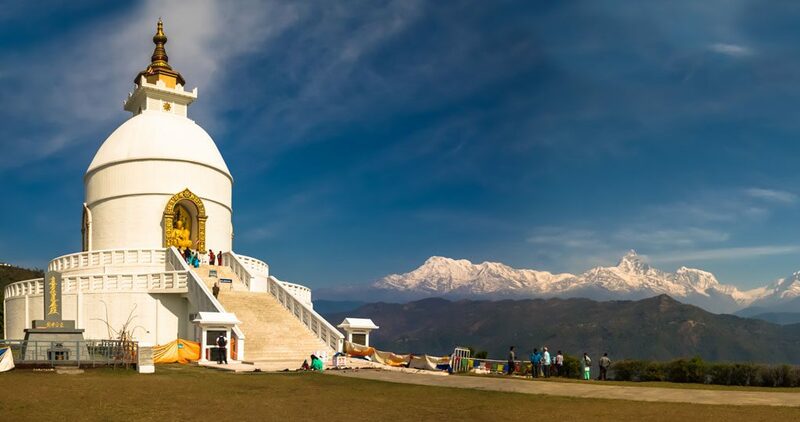 World Peace Stupa: One of the popular hiking destination in Pokhara. You will get the spectacular view of Annapurna mountains and Pokhara valley from the top of the hill. Sarangkot: You can enjoy short hiking to Sarangkot. From here, you will get the amazing view of Mt Annapurna, Mt Dhaulagiri, Mt Machhapuchhre, and so on. And also do not miss the Sarangkot sunrise view. It will be one of the best experience of your life. Mahendra Cave: This cave is rich with different types of rocks and glittering stones. The artificial lighting systems are all fitted to illuminate this natural tunnel cave. You will see a statue of Lord Shiva in the middle of this cave. Bat’s Cave: This cave is home to more than 15,000 of different species of bat. The entrance to this cave is narrow but the inner part is wide enough. The inner part of the cave is all carved with various images of elephant tusks, gods and goddess. Davie’s Fall: Davie’s fall is an area known for its beauty and tranquillity. The best time to visit this place is during monsoon season as the volume of water increases significantly. International Mountain Museum: Here, you can learn about the history of the mountains. You can also do a lot of mountaineering activities. You can also find some of the hidden mysteries related to Mount Everest. If you are a nature lover, then Chitwan is a perfect place for you. It has rich flora and fauna. Chitwan receives more than 200,000 visitors per year from around the world. This National Park is a World Heritage Site registered by UNESCO. The main attraction of this place is Chitwan National Park. Chitwan national park is one of the most famous tourist destinations in Nepal. The dense forest and grasslands are homes to rare animals like Bengal tigers, one-horn Rhino, and other exotic birds. You can also explore the rich culture and history of Chitwan, rather than just a nature to enjoy. Chitwan National Park: Exploring the community forest, jungle safaris are the most popular things to do here. Beside this, you can also encounter the lifestyle and culture of local ethnic groups like Tharu, Bate, and Majhi. Ranipokhari: This is the newest destination in Chitwan where you can indulge in boating as well. This place is also famous for the picnic. Bishazari Taal: The meaning of Bishazari Taal is 20 Thousand Lake. This place is home to many animals like deer, rhino and tiger. This area also serves as an excellent bird watching center. Chiraichuli Hill: It is one of the new destinations to visit in Chitwan. It is above 946 meters height and an excellent place for the sunrise view. Lumbini is the place where queen Maya Devi gave birth to Siddhartha Gautam – Gautam Buddha. UNESCO enlisted the Lumbini as a world heritage sites as it represents the Buddhist history and culture. There are many inscriptions and evidence of Lumbini being the birthplace of Lord Buddha. This place is purely blessed by the various holy sites and shrines which represents the various stages of Buddha’s life. You can find varieties of remarkable stupas, monasteries built by Buddhist nations from across the world. Maya Devi Temple: It is the most important temple of Lumbini which marks the spot where Lord Buddha was born. Later, this temple was re-built in a white building to protect the exact spot of Buddha’s birth, denoted by a marker stone. World Peace Pagoda: This pagoda has a golden statue of Lord Buddha which depicts the position of Buddha when he was born. This pagoda is one of the world’s greatest stupas, constructed by the Japanese at the cost of US 1 million dollars. Lumbini Museum: Lumbini museum is the holy site devoted to the life of Buddha. You can see a different collection of photos and artifacts from Buddhist sites around the world. Myanmar Golden Temple: It is one of the oldest structure in the compound. It has three prayer halls in the Myanmar Golden Temple. Besides this, there are other temples including China temple, Korean temple and so on. Apart from these beautiful cities and towns, you can also explore Nepal to a different level. You can get on to the off-beaten track of Nepal to experience the wild landscapes and majestic high Himalayas. You can explore the true colors of Nepal with unspoiled flora and fauna and spectacular mountain views. Plus, the diverse cultures and charming small villages add to your joy. A trek to Everest Base Camp will take you to the lap of the highest peak of the world – the Mount Everest. You can encounter the breathtaking views of Mt Everest and its neighboring peaks. It is an epic journey where you’ll trek all the way through rhododendron forests and snowy land. You can get a glimpse of beautiful Sherpa villages, monasteries and prayer flags throughout the Everest region. Nothing beats the thrill of this journey and grace of astonishing mountains up close. Thus, a journey to Everest Base Camp is worthwhile. Annapurna region is one of the popular trekking trails in Nepal. There are many amazing treks to this region which offers you the beautiful scenery of mountains and lowland villages. Annapurna, Machhapuchhre, Dhaulagiri, Manaslu, Nilgiri, Tukche Peak, and many more. While trekking to this region, you can see spectacular mountain views and fertile farmland. Alongside you will encounter the diverse ethnic communities, cultures and their lifestyles. Langtang valley is truly a gem of the Himalayan country, Nepal. It has more than 70 glaciers varied in sizes. So, this valley is also called the “valley of glaciers”. A trek to Langtang valley offers you the spectacular view of mountains, splendid nature, and scenic landscapes. You can also experience the wonderful cultures of the native Tamangs. Langtang valley lies in the Langtang National Park which is the second largest national park of Nepal. This area has diverse flora and fauna and also home to many rare animals and exotic birds. Rara lake is the largest and deepest freshwater lake, situated in the far western region of Nepal. The Rara lake, nestled in Rara national park is completely untouched by the urbanization. The rich flora and fauna of this park add beauty to this lake. This national park is also home to many endangered species of animals. The route to Rara lake is quite rough but at the same time, it offers you the beautiful view of lakes, mountains, and hills. Gosaikunda lake is a holy lake and one of the most popular pilgrimage sites of Nepal. This lake remains frozen for six months in winter and the ice from the lake melts down to form Trishuli River. During Janai Purnima, a large number of Hindu devotees come to take a holy bath in the river. On the way to this trail, you can see beautiful views of mountains and the numerous small and big lakes. Thus, this lake holds a significant religious value adding to the religious and natural heritage of the country. Tilicho lake, located at Manang district, is the lake at the highest altitude in the world. The trek to Tilicho lake offers you some majestic panoramic view, great variety of cultures and finest deep valleys. And you will get the views of the high mountains encircling the giant Annapurna Himal. The place is rich with a wide range of people and terrain. 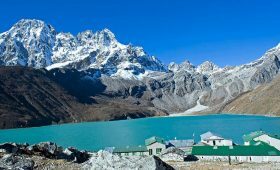 Thus, trekking to Tilicho Lake grants you a wonderful experience of beautiful view along with the diversity of people. The trekking leads down to Muktinath temple which is highly important in religious point of view and has its own sort of beauty. The trip to Tilicho Lake is a perfect place to witness natural scenery and learn about the unique culture. If you want to see spectacular mountains, then visit Nepal and experience trekking to astonishing high Himalayas. The mountains of Nepal have always held a mysterious charm. Their allure has captivated many people and has made heroes. Some of them have disappeared in their quest and moment of glory. You can trek to Everest region, Annapurna region, Langtang Valley to see breathtaking mountains scenery. Nepal has the highest number of heritage sites recognized by UNESCO as world heritage sites. The eight different places of Nepal are on the list of UNESCO world heritage sites. Out of eight, seven of them are in the Kathmandu valley and one is in Lumbini. The heritage sites of Nepal is a splendid example of art, architecture, and culture. Most of the travelers prefer to see Nepal’s cultural heritage sites. You can explore many Hindu temples along with Tibetan Buddhist pilgrims, stupas and monasteries. Jungle wildlife tours is an amazing adventure trip in Nepal. It offers you the chance to enter the jungle and view some of the most endangered wildlife on earth. So, the dense forests of Terai could be the best places to visit in Nepal. Usually, Jungle safari tour lies in southern lowlands of Nepal-Terai. This area is fully covered in dense tropical jungles and is home to thousands of bird and animal species. You can experience elephant riding, jungle safari, bird watching, and recreational activities. In Nepal, you will discover the stunning view of jungle, fascinating wildlife and exotic birds. Nepal is a small country, yet, it has a lot of popular destination to visit. You will get a number of options while choosing the best places to visit in Nepal. The diversity in nature and a variety of exotic culture makes Nepal a most popular destination. In addition to this, there is an innumerable list of places in Nepal that you can visit and explore the beauty of Nepal. Whether trekking to Mt. Everest or visiting the birthplace of the Buddha, a trip to Nepal is a top destination for many travelers.